Hot Tub Filtration is Very Important to Keep Your Water Clean and Clear. Our Hot Tubs are equipped with a 24 Hour Programmable Filtration Design that utilizes Pump #1 on low speed to properly filter your water. Many spa design engineers consider this to be the most economical and reliable technique to filter the water in a hot tub. Like a water well pump, our 56 Frame Pumps are designed for long life operation even in a frequent on/off environment. Your hot tub will be filtering whenever you are using it with pump #1 on, or whenever the program calls for a filtration cycle. For even faster filtration, the pump can be turned on high speed, which will pass all of the water over the filters every 2.5 minutes. The amount of time you should filter your hot tub will depend on certain factors, such as how frequently you use the hot tub, how many people use it, if the people shower off before they use the hot tub, if there is trace amounts of soap in swimsuits, etc. Some spa companies promote adding an extra low capacity pump that is "dedicated" to "always on" filtering of the spa water. These are often called 24 Hour Circulation or Filtration pumps. "Always on" also means always operating at maximum capacity and always using maximum electricity. You cannot increase the filtration if there is heavy use of the tub (example: after a party), you cannot decrease the filtration to save on energy (example: just a couple of you use the hot tub, or being away on vacation). We believe the filtration design that we, and companies like us use, is superior for you, the customer. Water is drawn in through the skimmer and then passes through the filters. This ensures proper filtration of both surface water and the water below the surface. Skimming off the surface water is important because many undersireable elements (such as bacteria, body oils, soaps, etc.) can be "caught" floating on top of the water. Since Pump #1 is plumbed to over 2 dozen individual jets, the filtered water returning to the hot tub will thoroughly mix within the tub. Using this higher-volume pump to filter the water allows for fewer total hours/day that the pump must be on, potentially saving electricity and maximizing the life of your pump. 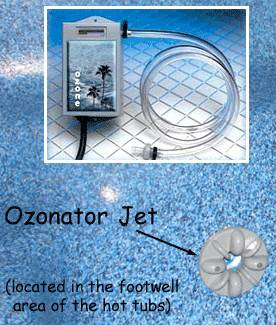 Corona Discharge Ozonator is standard on all of our hot tub models. It works in conjunction with your chlorine (or other sanitizer) to destroy bacteria and purify your water. Unwanted solids in the water will then get trapped in the filters whenever pump #1 is operating. Filters can be periodically cleaned and/or replaced. Our Free Spirit and BellaGrande Models have 2 x 50 Square Foot Filters (100 square feet of filtration) and our smaller Avalon models have 1 x 50 Square foot Filter. The filters are located inside the skimmer and are user replaceable. Changing Your Spa Filters is Quick and Easy. Avalon models have a single filters, all other models have dual filters.